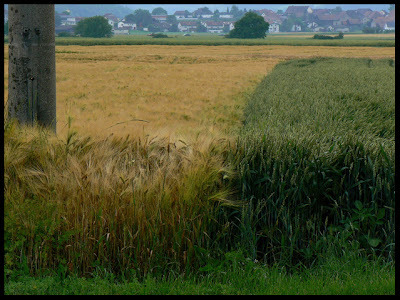 The crops that I've been showing are almost all along the main road that becomes Hauptstrasse when it enters Villigen. Lots of variety in a small space. The village visible in the background is a neighboring village called Rüfenach. I wonder if they both could be the same plant...the green was planted later, it is a fdifferent variety, etc. I googled wheat and it's images...and the one you showed yesterday still looks like wheat to me. Very interesting. My day was a wheat farmer in Oklahoma and I know he raised different varietites, based on hardiness and soil content. I think green crop is wheat and late a little bit. It ought to be most yellow. Your picture is interesting ! is the difference of colours still vivible ? I think green crop is turning yellow a little.